Beneath what seems like a reasonable feature request lurks the heart of technological conservatism: what was and is always shall be. The best thing about the poor VLC 2.0 is that I’ve discovered the much nicer MPlayerX (free in the Mac App Store). Like VLC, MPlayerX is open source and plays a large variety of file formats, but unlike VLC it looks like it belongs on a Mac. In fact, it looks and behaves a lot like QuickTime. I especially like that all the chrome fades out when your mouse is off the window, leaving just the video. There are other features that I didn’t realise I was missing out on. For example, it remembers where you are in a video when you close the app so you don’t have to go searching for your place next time you start it up. Also, if you are watching a series that is logically named, it will automatically start playing the next episode for you. You can turn that off, but it’s a feature I appreciate. So far, my only annoyance has been the limitation that you can only resize the player from the bottom-right corner. Still, at least it respects the media’s aspect ratio — something VLC can’t do any more! A while ago I asked if there were any good fractal generator apps for the Mac. I’ve found Oxidizer so far, but it looks a little limited (although I haven’t actually tried it yet). Well, I was wrong. It’s brilliant. I’m hoping to produce a series of images using it, and maybe even some animations. I’ve also installed Electric Sheep as my screensaver (multiplatform). Here’s a fun little IOGraphica diagram showing 2.5 hours of me browsing the web, reading Twitter and using Photoshop for a bit. I also wrote the previous blog post. The black and white doodles in this gallery are what the app produces. I’ve overlayed it to a screenshot of my desktop showing the typical positions of Google Chrome and YoruFukuoru for context. The large dots represent times when my mouse was stationary. I have a hot corner set up in the bottom right to put the display to sleep. Though IOGraphica is only presented as a curiosity for making ‘modern art’ pieces, I imagine it could be used as a basic heat map tool for running basic usability tests on software or websites. This is a little tool I made in connection with the 10th Ludum Dare competition held in December 2007. Its original purpose was to provide a simple means of getting basic sound effects into a game for those people who were working hard to get their entries done within the 48 hours and didn’t have time to spend looking for suitable ways of doing this. You can grab Windows and Linux versions of sfxr from that page. He also links through to cfxr, a Mac port (screenshot above). I found this through a Unity video tutorial I’m watching. My 27″ monitor throws out a lot of light, and F.lux instantly makes it much easier on my eyes. I’m not sure if I’m going to be able to live with it though, as even after 15 minutes, I can still perceive a yellowish hue. It may be because I have two types of fluorescent bulbs in this room, and neither are giving the colour temperature the app expects. A fine-tuning control may help. For someone who isn’t interested in graphics work of any kind, this free download may be a lifesaver (or at least a life-improver). Available for Mac, Linux and Windows. My computer history, briefly, has been Acorn Electron, Amiga 500, various PCs running Windows 95, then ME and finally XP, which brings me to the machines I use now. I have an Eee-PC netbook (which for a year was my only personal computer). I experimented with a few Linux distros and eventually settled on CrunchBang Linux. Are there any good fractal generators for the Mac? There are some great options for Windows users, including Chaoscope and Apophysis. I’ve also just found Mandelbulber for Windows and Linux. Is there a hidden gem for Mac users somewhere? EDIT 12.01.2011: Actually, Oxidizer is brilliant. More recent post. GeekTool is a system monitor for Mac OS X, which will let you display system information or various feeds from the internet on your desktop. It’s like Conky for Linux, if that means anything to you. There are many, many scripts you can use to display weather forecasts, CPU and RAM usage, free HD space, the latest XKCD, unread emails, the track now playing, Twitter messages and pretty much anything else you can think of. 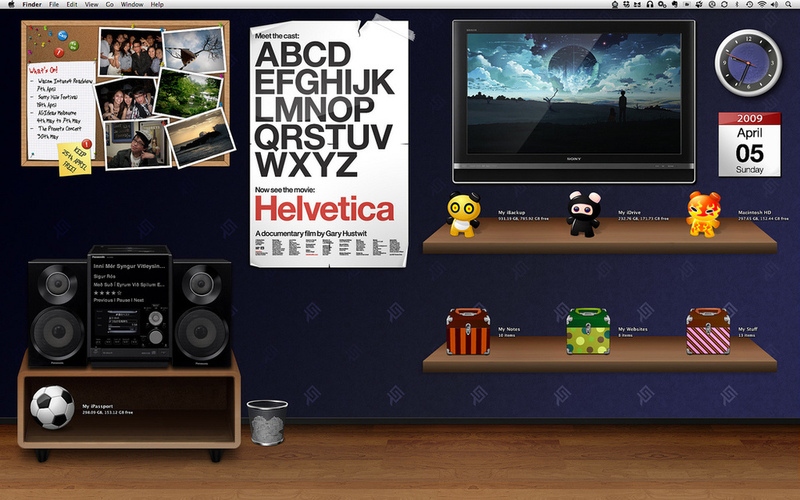 As the examples I’ve attached to this post show, you can do some really creative desktops.